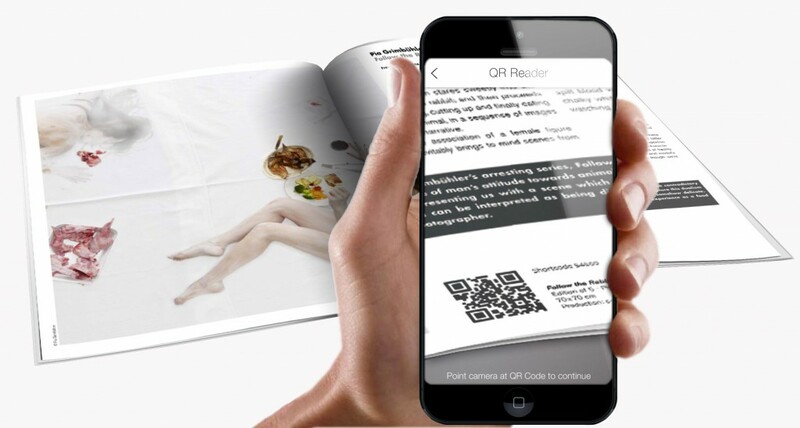 An augmented reality app for gallerists, art dealers, and artists to generate sales. 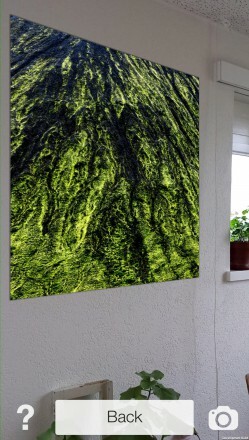 It lets your clients and collectors preview how an artwork will look on any wall. The key to selling is helping your customer understand how something could benefit him/her. Visualization is key in this process. By presenting an artwork in place in a hyper-realistic way, customers find it easier to make choices. They want to understand how paintings, photos and other works will look in their environment in real-time. ArtBeamer is the easiest way to preview how art and images will look in place. The free app allows clients and collectors to display your artworks to scale at home. They will be amazed to see works appear as if they were truly there! This makes the sales process efficient and saves galleries, artists and interior decorators lots of time! Sign up for a FREE 14 diays trial! C'mon- It'll be fun! Within minutes you will be able to beam your first picture with augmented reality. Your free trial is activated without requiring any credit card or paypal information. How can I use ArtBeamer? Art dealers know the situation all too well: a collector likes an artwork, but wants to do a test hanging before making his or her final decision. Instead of lending the work to the client, in a few seconds you can upload it to the app. Let your client know the code (e.g. 12345), and he will be able to “beam” the specific artwork that you exclusively provided to him. Give an undecided client the assurance that the work actually fits him and his interior! As an art advisor or interior decorator, you want to find out which works fit a client’s space and taste. But previewing them on site is often impossible. With ArtBeamer, you always have your entire portfolio with you. 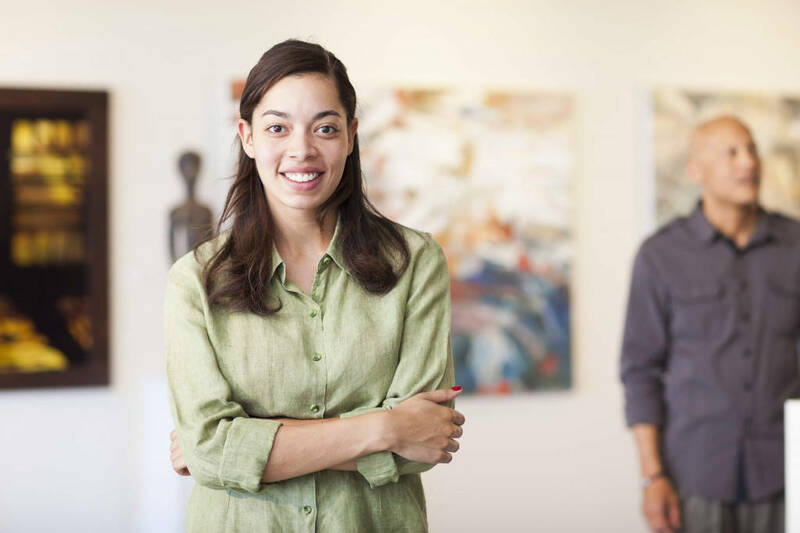 It lets you personally advise your client regarding the selection of and best location for works of art – whether at home, in the office, or elsewhere. Walk through the space and make him see all options you have to propose. Many artists have the same burning question: How do I make more sales? What you need are effective sales tools to build your collectors base. With ArtBeamer, visual artists and photographers can present their entire portfolios to the world, within their customized app. Buyers can browse your catalogue and visualize the works in their own spaces. Offer them a first class advisory tool, and they will purchase with confidence. Do you have printed an illustrated catalogues or invitation cards? Do you showcase your creations on your website? Make people experience them! You can tag each artwork with a code (e.g. 12345) or a QR code. 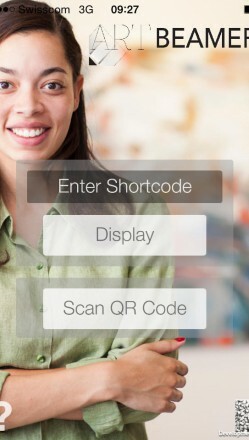 Visitors browsing your website or your printed catalogue simply type the code into the ArtBeamer app. They will immediately be able to “beam” the artwork in their space and discuss it with their families. It’s as simple as that. STEP 1. Our catalogue management system (CMS) allows you to upload your artworks, add information and create sale offers within minutes. If you are a white-label client you can also continue to use your own existing system. STEP 2. Your clients download the ArtBeamer app to their mobile devices for free, and have instantly access to your portfolio, or to a few selected artworks (using ad-hoc shortcodes). All this from the comfort of their homes. STEP 3. Your customers ‘beam’ artworks directly at home or at the office. This allows them to test the artwork in space, making them confident. You keep the whole amount from the purchase, ArtBeamer doesn’t have any selling fee! 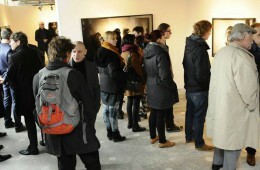 The Iceland Art Project is a venture by acclaimed Swiss photographers Peter and Ursula Schaeublin. 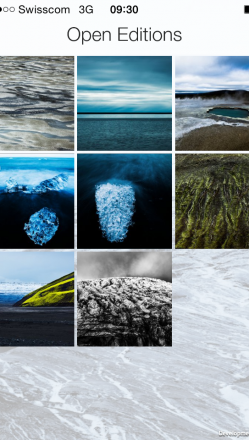 They use steel plates, exposed for weeks to the rough Icelandic climate, salt water, sulfur and soil, as a support for their large-scale landscape photographies. 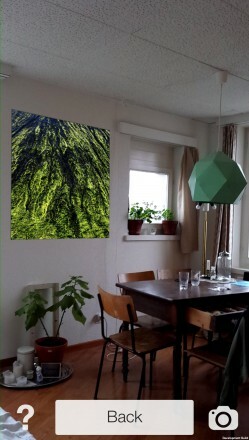 To promote their unique creations, the photographers uploaded their artworks to ArtBeamer and personalized the app with their logo and contact information. “We were surprised that we could come up with our own app, just like that, and present our work to our collectors”, says Peter Schaeublin. Test it yourself. Download the app and insert the code 015267. 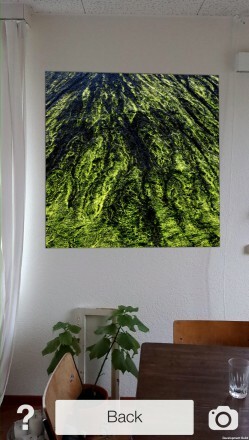 Visualize the Iceland Art Project’s artworks in your own space. Step 1: Download the app to your iOS or Android mobile device. Step 3: Place the target on to the wall. Select an image and beam it. FineArtPrint.de is a leading custom on-demand printing provider for collectors, interior decorators, photographers, and artists. Clients access the website, choose an image, select the size and medium and receive the print a few days later. ArtBeamer allows potential buyers to test all available images, mediums and sizes – literally millions of different combinations – in their own spaces. For that reason, we built an interface to the FineArtPrint.de system, so that they can continue using their own backend and database. Figures show that FineArtPrint.de clients use the ArtBeamer app extensively in order to select an image and figure out the appropriate and exact size. 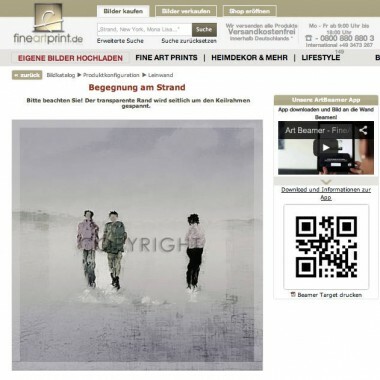 FineArtPrint.de significantly improved the customer friendliness of their website. They created attention and have gained an advantage over competitors. The easiest way to visualize art in your space. When customers find the artworks they want to buy, they can ``beam`` it to visualize it in their own spaces! Previewing artworks in space helps customers decide to buy. Or they can continue browsing your catalogue until they find exactly what they want! ArtBeamer offers you the power of augmented reality - at your service and to boost your sales! Register today and enjoy 14 days free trial - no strings attached! Why is ArtBeamer for me? ArtBeamer is great for artists, galleries, fairs and auction houses, and ideal for anyone who wants their customers’ doubt about the artwork fitting be simply dissolved. With ArtBeamer your artworks can easily figure out if an artwork fits the space, check styles and sizes and ultimately buy from you with confidence. For the first time, ArtBeamer allows dealers and artists to lend out valuable artworks virtually without shipping them, with no risk or trouble. Art dealers know the situation all too well: a collector is very interested in a work of art, but first she wants to see it in place in her home before she makes her final decision. Or, you would like to give an undecided customer the assurance that the work actually fits him and his interior. Instead of photoshopping the art into a photo of her home or lending the work to the uncertain client, in a few seconds you can display the image in the app. The collector tests the work on his or her mobile device, beaming the image and seeing it on the screen as if it were on the wall. If they remain uncertain, it’s easy to send a screenshot, allowing you to further assist with the selection process as if virtually visiting the collector’s home. Furthermore, the app helps you achieve presence on millions of mobile devices and opens access to numerous new promotional possibilities. Prospective art buyers can stumble upon the app under your gallery’s name in the App Stores. The “wow-effect” of this cutting-edge application helps you to enlarge your circle of customers and to surprise your existing client base with an exciting innovation. With ArtBeamer, visual artists and photographers have the possibility to present their complete current portfolios on mobile devices. Interested buyers can visualize the images in their own spaces. The precise appropriate size of a photographic print could even be decided before it is ordered. The app helps potential art buyers in the selection of works and supports artists and photographers in the sale, interpretation, marketing, and promotion of their art. Auction houses arrange preview showings to highlight some of the most promising items up for sale in the next auction. However, it remains difficult for the bidder to imagine how the work will appear in his or her home, especially if only an auction catalogue is available and he or she cannot visit the preview. As a result, some potential bidders may hold back. With ArtBeamer, auction houses can put this uncertainty to rest. By entering the lot number, the bidder can visualize the entire catalogue at home to scale. The auction house’s branded app is a fully functional catalogue for mobile devices and can be found in App stores. During preview showings, it can even function as an exhibition tour and audio guide. The app owner maintains full control over its content. New images can always be uploaded and made available in seconds using our cloud-based databank system. During visits to clients, the art can be effortlessly visualized, appearing as if on any wall. The selection, placement, and size of a work can be determined together with the client in the exact location, streamling the decision-making and sales process. Do you offer art or photographic reproductions online? Do you already have a webshop, perhaps one in which customers can select the size, the medium, and/or the finish of their selected motif based on their own preferences? ArtBeamer can help here as well. Customers can test the customized image on their own walls before proceding to the online check-out. They can also verify and discuss the final details including frame and matting selections. Your marketing efforts receive a boost and customer satisfaction is guaranteed. Bring your entire catalogue online on smartphones and tablets. Your portfolio goes mobile! As white-label client, the app will be personally branded for you and can be used with your own database. But even our general app offers you great customisation already! ArtBeamer is available on app stores for your clients for free. If you decide for a white-label solution the app will be findable under the name of your own business. A computer and an internet connection are all you and your customers need. Edit your artwork catalogue from anywhere. Your catalogue is accessible from anywhere. You can directly add, edit or delete artworks via our easy collection-management system. 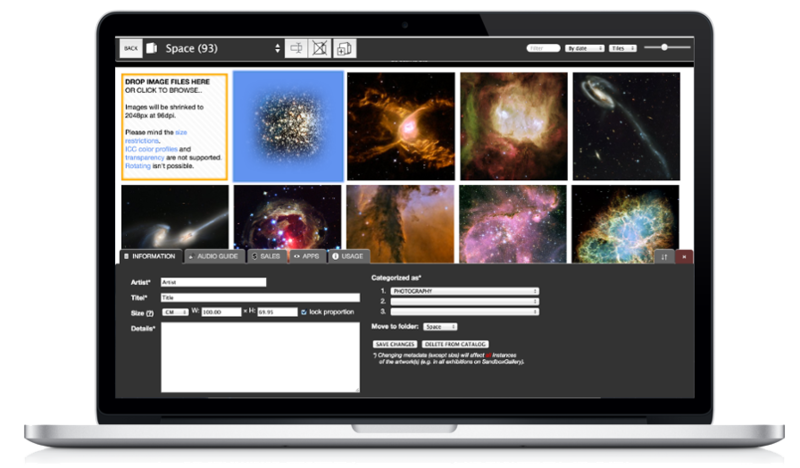 Our “beamer” function allows you to preview artworks in space. If you want more we even offer fully navigable 3D exhibition spaces. With ArtBeamer you don’t need to spend tedious hours preparing photoshop images for your clients, nor do you have the worry of sending artworks to their homes for trial. They simply ‘beam’ it to know immediately how the actual artwork will feel in their space. You save time, give your customer faster service, and expedite the sales process. ArtBeamer integrates with your e-commerce site, allowing your clients to ‘beam’ your artworks in space and then buy from your existing platform or contact you personally. It enhances your sales. Help with selection; your clients purchase with confidence! After the client has decided for an artwork or a series of artworks, according to price, style and/or personal desire, one last question remains: “Does the artwork fit my space, will it harmonize with its future surroundings?” ArtBeamer helps solve these problem, visualizing the artwork as it would be in space for your client, giving him the security that it will fit, so he can purchase with confidence. 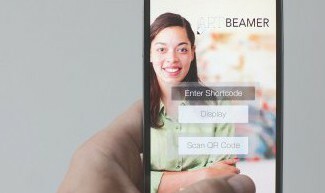 All you need is a smartphone or tablet and the printed ‘target.’ Your client starts the app, points the camera at the wall and ‘beams’ -as easy as it gets! The App is available in Android and Apple stores. Downloadable and installable with a click, it’s easy to reach for you and your clients. One or many images – the decision is yours! You can decide to upload your catalogue on ArtBeamer, giving customers the possibility to browse comfortably from their homes. They ‘beam’ artworks in their spaces until they find the right match and contact you to purchase. Or you can upload fewer artworks. Our Catalogue-Management System gives you freedom and flexibility. You also have the possibility to ‘beam’ particular artworks only to specific clients. If your collection is very large, we can export it to our Catalogue-Management System automatically, saving you the trouble of transferring large amounts of data and information. Or we can also directly connect the App with your existing database, allowing you to continue to use your current system. Your gallery goes mobile! And mobile is where most of the purchases will happen in the future. Our solution integrates today’s mobile needs with a powerful and compelling sales tool developed with the future of the art market in mind! All artworks in ArtBeamer are displayed to scale. This makes ArtBeamer highly effective as a visualization tool. Your clients will see the ‘beamed’ artwork exactly as if the real artwork were in their space. Your client doesn’t need to remember the actual size of the artwork or stand at a certain distance; the app adjusts everything automatically! Our Catalogue-Management-System (CMS) is available everywhere; you only need a computer and an internet connection. With just a few simple clicks, you can manage your artworks, add information, prices and even audio tours, and make them available for ‘beaming’ in your app. Our Catalogue-Management System is suited for large catalogues and small collections alike, allowing you to easily upload and edit large quantities of artworks. Manage them with different overviews, each suited to your changing needs. The App is available in the App stores under your gallery name, both making use of and strengthening your brand! Up-to-date technology: become an industry leader, no specialized IT knowledge required! 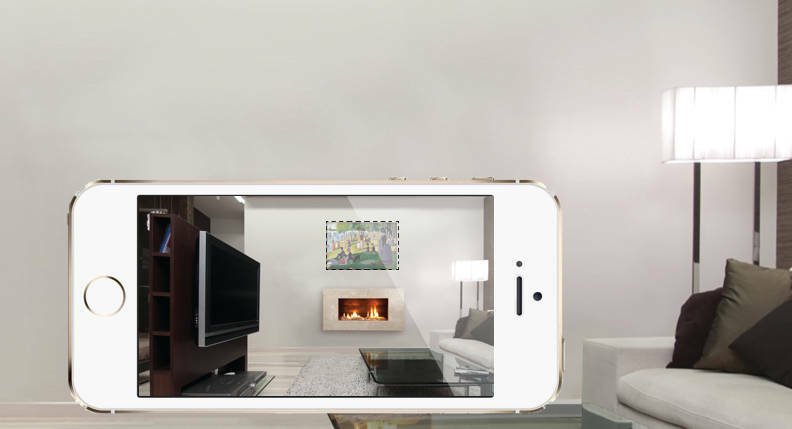 ArtBeamer utilizes the innovative concept of Augmented Reality with the most up-to-date technology in the industry. By adopting ArtBeamer, you become an innovative industry leader at the forefront of technology, yet without the need for specialized knowledge; we take care of everything IT-related for you! You can provide your clients with a pre-made frame that will be ‘beamed’ on the wall together with the artwork, or let them browse through a collection of framing and matting options to choose their own. We assure Swiss quality in our products, services and support combined with international experience and a broad outlook. ArtBeamer integrates an optional function to allow your clients to share your beamed artworks with their friends. This facilitates direct feedback from their peers and indirectly boosts your visibility among other possible clients.